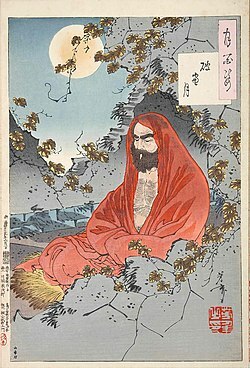 Bodhidharma, Ukiyo-e widblock prent bi Tsukioka Yoshitoshi, 1887. Bodhidharma wis a Buddhist monk wha leeved during the 5t or 6t century. He is tradeetionally creditit as the transmitter o Chan Buddhism tae Cheenae, an regairdit as its first Cheenese patriarch. This page wis last eeditit on 20 Apryle 2017, at 00:48.